A dramatic mountain landscape awaits you on this superb, eight-day holiday in Switzerland. Based in the beautiful resort of Chateau d’Oex, enjoy breathtaking Alpine scenery and fresh mountain air as we delve into a remarkable landscape to explore the Bernese Oberland, the shimmering shores of Lake Geneva, pretty capital Bern and the traditional cheese-making town of Gruyeres. Flights also available from other UK airports – London Gatwick, London Heathrow, London Luton & Manchester, – click here for more information on available dates and prices. Fly to Geneva, meet your Tour Manager and make the scenic transfer by coach to Chateau d’Oex, travelling along the shore of Lake Geneva before heading up through green pastures to your beautiful holiday base. Sitting at the heart of the Pays d’Enhaut high country region, Chateau d’Oex is set in a beautiful spot among soaring mountain peaks and toppling hillsides. You’re free to explore today, choosing to be as active or relaxed as you wish. For the energetic, there are a host of sporting activities and miles of pretty walking trails. For those who wish to explore at a more leisurely pace, take in the views of the sumptuous landscape on a cable-car ride, or enjoy the pretty alpine town, home to a trio of fascinating museums that collectively chronicle local life through the ages, the history of cheese-making and the village’s world-renowned reputation as a hot-air-ballooning centre. 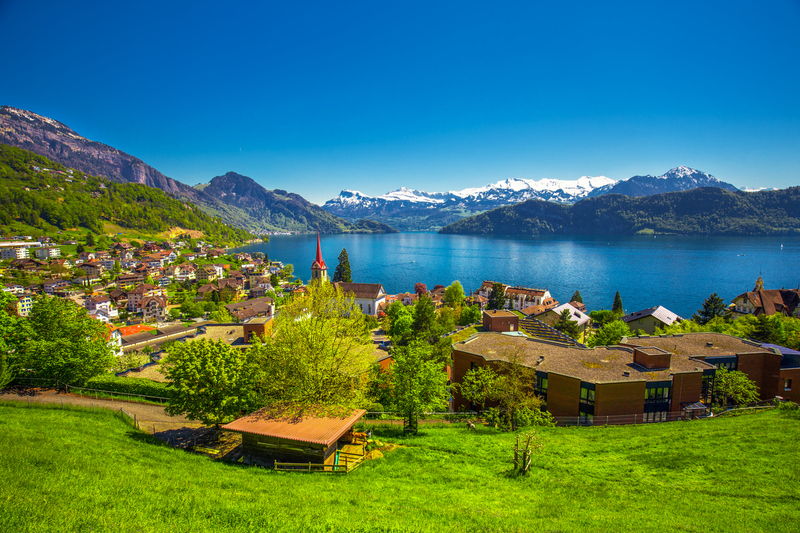 Today’s optional excursion showcases Switzerland’s historic heartland, once home to legendary Wilhelm Tell. Take a boat trip on the lake to enjoy the marvellous scenery, visit the famous Chapel Bridge, and explore the Transport Museum in Lucerne, an enchanting city known for its medieval architecture. A full-day tour today reveals one of nature’s greatest masterpieces: the spectacular Bernese Oberland. Travelling through dramatic countryside, we’ll visit Lake Thun and the bustling resort of Interlaken – overlooked by the snow-capped Jungfrau mountains – as well as spectacular Grindelwald, situated at the foot of the mighty Eiger. Head for the sun-kissed shores of Lake Geneva on today’s optional excursion. We’ll travel through the heart of the Swiss wine-producing Valais region to the fashionable resort of Montreux, which basks in a balmy microclimate thanks to its sheltered position beneath the Alps. This delightful town is home to a famous Jazz Festival and has a beautiful promenade that skirts the lake. Close by, brooding Chateau Chillon, Switzerland’s most famous landmark, guards the dark secrets of the past, and makes for a fascinating visit. Today we discover the historic Swiss capital, Bern. With its pretty, medieval houses, great churches and wonderful covered shopping arcades all huddled together above a sweeping meander in the River Aare, Bern is a city of great beauty. Allow time to see the famous mechanical clock before we return to Chateau d’Oex in the late afternoon, making a call in the charming town of Fribourg en route (time-permitting). This ancient university seat boasts an attractive old town, with haphazardly arranged houses on cobbled streets sloping steeply away from the River Sarine. Our final included excursion takes us to quaint Gruyeres, the famous cheese-producing town with a flower-decked, cobbled main square. Enjoy a demonstration of the cheese-making process (entrance to the factory and museum payable locally), which combines ultra-modern technology with centuries-old traditions, before returning to Chateau d’Oex for a last, restful evening in the resort. Bid farewell to your alpine idyll, and return to Geneva Airport for the return flight back to the UK.